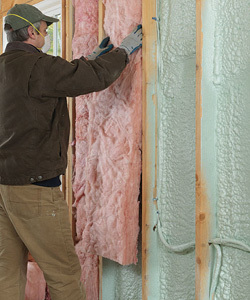 Fiberglass insulation and spray foam insulation are two of today’s most popular building insulation products. Fiberglass insulation has a competitive price point and spray foam insulation has air sealing benefits. Flash and batt installation brings together these two products in one application for use as new home insulation, commercial insulation and industrial insulation. Flash and batt is also known as a hybrid insulation system. Flash and batt provides the benefit of air sealing with spray foam insulation at a lower price point than full foam. This is a great option for a contractor looking for air sealing and is mindful of a tight construction budget. In a flash and batt system, one inch of closed cell spray foam insulation is applied. Once this is dry, a fiberglass batt is placed over the top of the foam. Flash and batt insulation is a good insulator to consider if you are looking for the air sealing benefits of spray foam insulation at a lower price point than full spray foam. To learn more about flash and batt, click here. Ready for an estimate for your next project? Contact our office for a free estimate.